Like Idaho, Lincolnshire is renowned for potatoes. Lincoln, a cathedral city, is the county town of Lincolnshire and the city proper has a population of 86,000 or so. The earliest evidence of Lincoln are the 1st century BCE remains of round wooden dwellings from an Iron Age settlement discovered as recently as 1972. The Romans overran the area in 48 CE and built a fortress on a hill overlooking the natural lake formed by the River Witham In Viking times Lincoln was a trading center important enough to issue coins from its own mint and, over the next few centuries, Lincoln rose to significant national prominence. 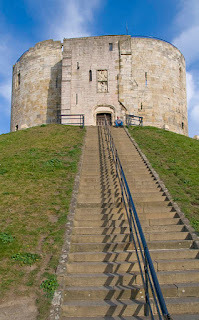 In 1068 William I (the Conqueror) built Lincoln Castle on the site of the former Roman settlement. 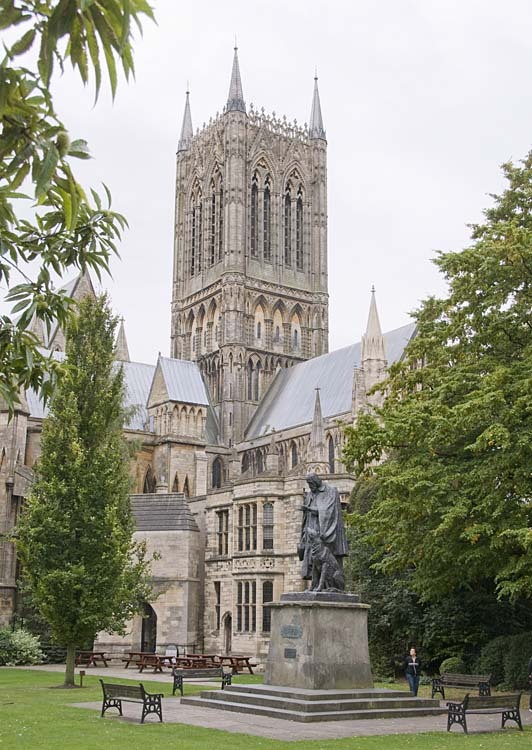 Construction of the first Lincoln Cathedral, the Cathedral Church of the Blessed Virgin Mary of Lincoln, was completed in 1092 but was built twice more within 100 years having been destroyed in a fire and later by an unusual earthquake in 1185. The central spire probably exceeded the height of the Great Pyramids of Egypt to rank as the tallest man-made structure in the world. 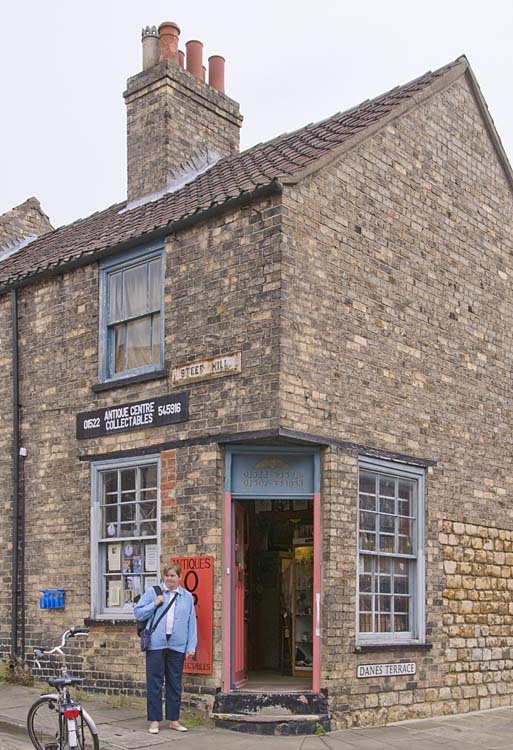 By 1150, Lincoln was among the wealthiest towns in England. The basis of the economy was cloth and wool, exported to Flanders. Outside the precincts of cathedral and castle, the old quarter clustered around the Bailgate, and down Steep Hill to the High Bridge. During the 14th century, the city's fortunes declined with the lower city being prone to flooding and suffering numerous plagues. When the cathedral's great spire rotted and collapsed in 1549 it was not replaced - a further symbol of Lincoln's decline. Overall, our visit to Lincoln was a great treat and much enjoyed. See more pictures here. Next stop was a pub campsite in the tiny village of Snitterby in Lincolnshire, population about 200. Things did not work out quite as planned for the cook at the Royal Oak had vanished and there was no food to be had. 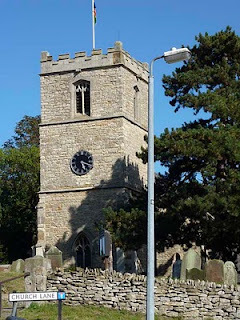 Not to fear, we quickly un-stowed the bicycles and cycled to the next village, Waddingham, where the Marquis of Granby pub served up a spectacular lunch. Considering the two way cycle ride, we felt lunch was well earned. After lunch, we checked out the rest of the village including Saint Nicholas Anglican parish church. Erected in 1780 on the site of an older structure, the church was rebuilt in 1866 and the tower was completed in 1894. The church seats around 180 - just about the entire population. Sadly, even in a tiny community like Snitterby, war has taken its toll with the WWI Memorial noting eight residents who fell in the hostilities. A few pictures of this speck of England can be seen here. Marian had never been to York before and my most recent visit was a school trip in 1953, so there was much to discover in this city of 137,000. 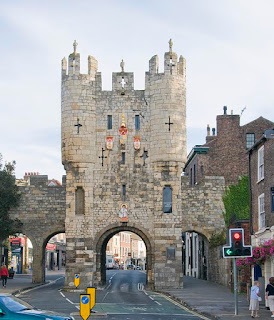 York is a walled city, having more wall length than any other English city - almost 2-1/2 miles of walkable walls - stretching between many of the six bars, or gates that control access to the old city. In recent decades, the economy of York has shifted away from reliance on candy companies such as Rowntree and Terry along with various railway-related industries, to one that provides services. The University has become a significant source of employment and tourism is a major contributor to city fortunes. Indeed, York was voted as European Tourism City of the Year by European Cities Marketing in June 2007 beating out 130 other European cities. The city walls are punctuated by four main gatehouses, or 'bars', (Bootham Bar, Monk Bar, Walmgate Bar and Micklegate Bar) and two smaller gates, Fishergate and Victoria. In medieval times the bars were used to control traffic as well as extact tolls and provide defensive positions in times of war. 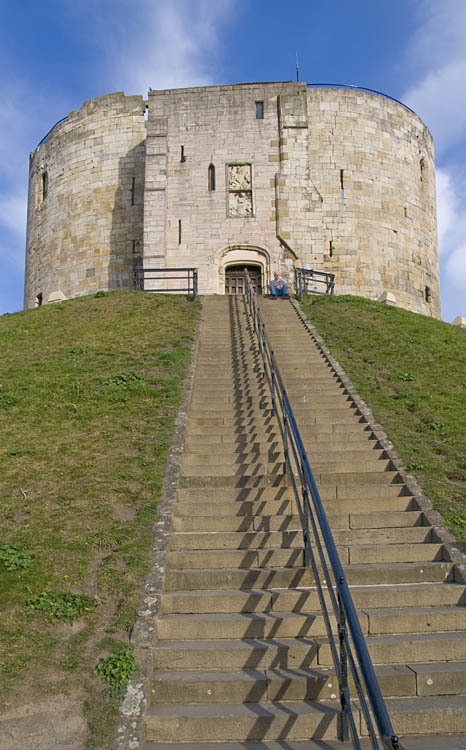 York has had a Christian presence since 300 CE. The first church on the site of the present Minster was a wooden structure built hurriedly in 627 to provide a place to baptize Edwin, King of Northumbria. Moves toward a more substantial building began in the 630s. A stone structure was completed in 637 by Oswald and was dedicated to Saint Peter. The present Minster was started in the 13th century. 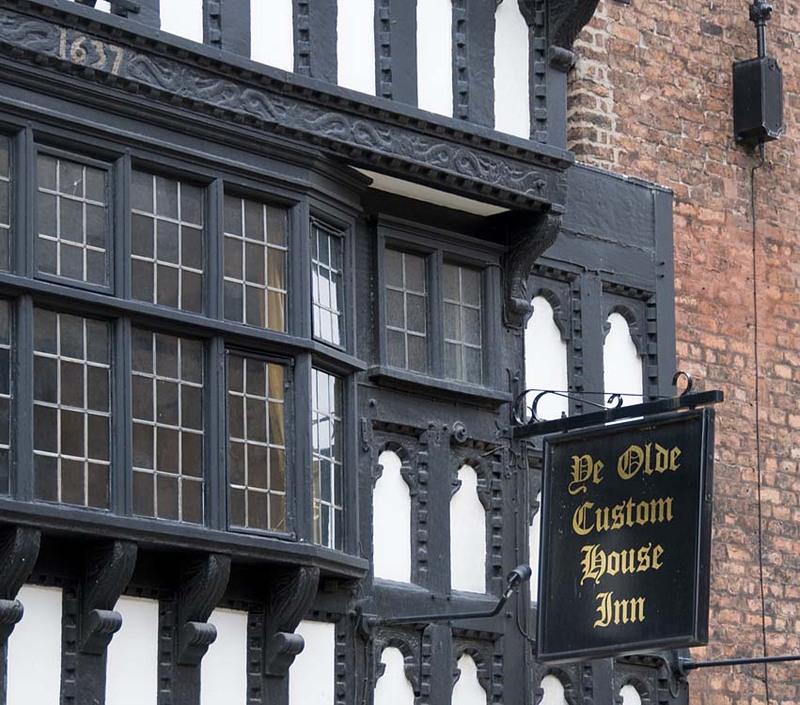 York is also renowned for an extraordinary number of pubs scattered throughout the old city and in the urban area around the city. Beware, there are LOTS of pictures to be seen Part I here and then Part II. We had never been to Chester before and had no idea what to expect. It was the largest city we had been in for a while, with a population in the range of 77,000. Chester is in the county of Cheshire and lies on the river Dee close to the border with Wales and was granted city status in 1541. 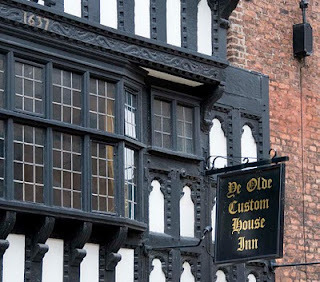 Originally founded by the Romans in 79 CE as a fort called Deva Victrix, Chester was one of the last towns in England to fall to the Normans in the Norman conquest of England. Today, Chester is one of the best preserved walled cities in the British Isles with only a hundred yards or so of the wall missing.Chester played a significant part in the Industrial Revolution which began in the North West of England in the latter part of the 18th century. In 2007 the "Chester Renaissance", a 10-year plan to see Chester become a "must see European destination" was launched by Chester Council. With a price tag of $2 billion, it was put on hold in 2008 with the onslaught of the financial crisis. Even at this, there is a ton of stuff to see in this busy and pub littered town. Like Ludlow, Oswestry is in the county of Shropshire, again close to the Welsh border and is home to 50% more people than Ludlow with its population of 15,000. The area has been inhabited since at least 550 BCE and Old Oswestry is the site of an Iron Age fort. 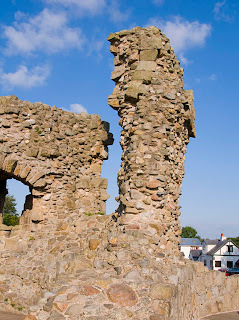 An Anglo-Saxon king, Oswald, was alleged to have been killed and dismembered at this location and, as legend has it, one of his arms was carried to an ash tree by an eagle. Miracles were subsequently attributed to the tree and thus it is believed that the name derived from "Oswald's Tree". A likely story. Since 1190 the town has held a market each Wednesday and, with an influx of Welsh farmers every week, the some town folk are bilingual. The town is also famous for its high number of public houses per head of population - about twice the national average. There are around 30 drinking houses in the town today, one for every five hundred men women and children. Check out some of these hostelries here. With a population of around 10,000, the market town of Ludlow is in the county of Shropshire, close to the border where England meets Wales. Lying on a hill between the River Teme and the River Corve, Ludlow has a castle, a market place and extensive remnants of the earlier medieval walled town. During the Wars of the Roses, Richard, Duke of York, seized the castle and turned it into one of his main strongholds. 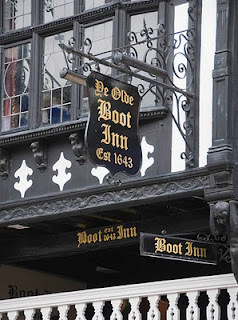 Ludlow has close to 500 listed buildings including numerous medieval and Tudor-style half-timbered buildings. The town also sports several coaching inns, public houses and ale houses. These, in times of yore, were the root cause of court records related to alcohol-induced violence and a reputation for excess. 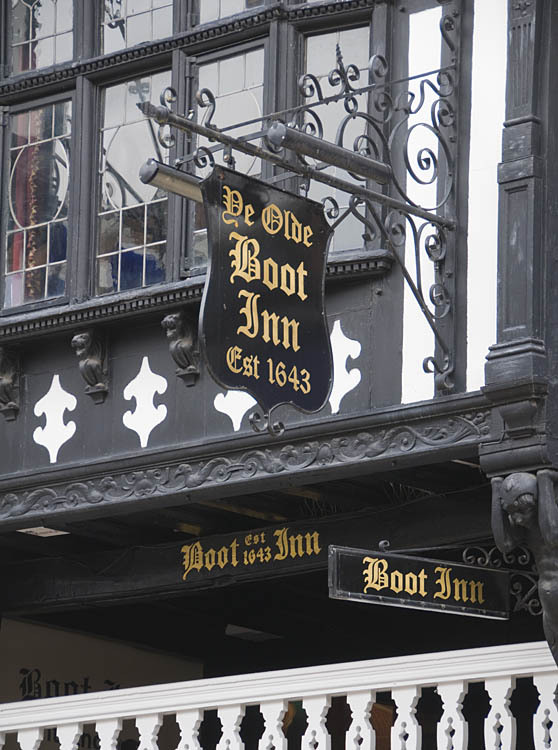 The oldest surviving inn today is the 15th century Bull Hotel. 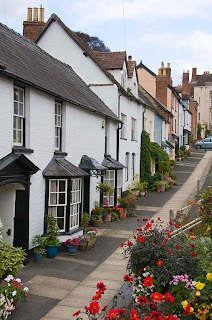 More pictures of lovely Ludlow here. 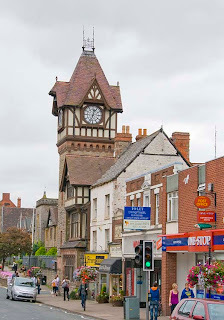 About 20 miles southeast of Leominster, still in Herefordshire, is Ledbury, another ancient market town noted in the Domesday Book of 1086 as Liedeberge. Elizabeth Barrett Browning, the poetess who, among many others, penned "How do I love Thee, Let me count the ways", spent her childhood years at Hope End just outside of town. 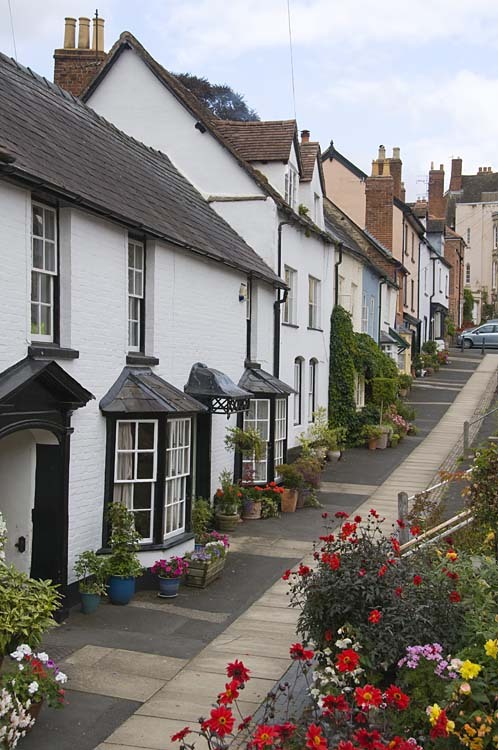 Although Ledbury is not much more than a one street town serving its 9000 population, it is a vividly engaging street with numerous and varied stores, lots of Georgian houses and an enviable Market House. Ledbury is also the venue for several annual poetry and music festivals and its Market Theater is a thriving enterprise near the town center, in Market Street. If England has a Smucker's Jam it might well be Robertson's Jams, for many years one of the largest employers in town. A sign of the times, Robertson's moved away in 2007 and the site now produces cider in a couple of 200,000 gallon tanks. Not too bad of a trade if you ask me. Pictures of this enjoyable town are here.